April 2009 - WeLCARS Turns Pro! 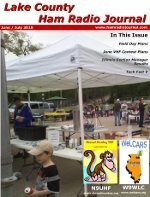 The Lake County Ham Radio Journal is published bi-monthly near the beginning of the month in PDF format. You don't have to live in Lake County or be a member of either club to download and enjoy the Journal. Each issue contains information about local ham radio events as well as articles of general interest to the ham radio community at large, such as product reviews, projects, and information about an aspect of ham radio you may not have tried, like a new band or mode. Our editoral tone isn't overly technical and we try to inject a little humor. Give us a try and you'll see what we mean. We're always looking for new articles or content. You don't have to live in Lake County to contribute, and we welcome articles that you might have submitted to other publications, like your local club newsletter. Our only caveat is the article has to be associated with ham radio somehow, but it can be a pretty loose association. We can accept contributions in a variety of formats: Word (.doc or .docx), OpenOffice (.odt), Rich Text (.rtf), HTML (.htm or .html), PDF (.pdf), and plain text (.txt) are a few that come to mind. If you've got an idea or a story e-mail us at editor@hamradiojournal.com - we'd love to hear from you! We'll have a subscription list to send out notices when a new issue is ready for download soon. In the meantime, check near the second week of the month for a new issue. Click on the cover above to download the current issue. Previous issues are also listed above. You will need Adobe Reader or a similar program for reading PDFs. You can download Adobe Reader by clicking the link below or visiting http://www.adobe.com.